“WRATH OF THE FIRST LANTERN” continues! After having ripped apart Guy Gardner, the First Lantern now directs his singular and horrific power at John Stewart, forcing the Corps to see the light and darkness of their lives in a frightening new way! 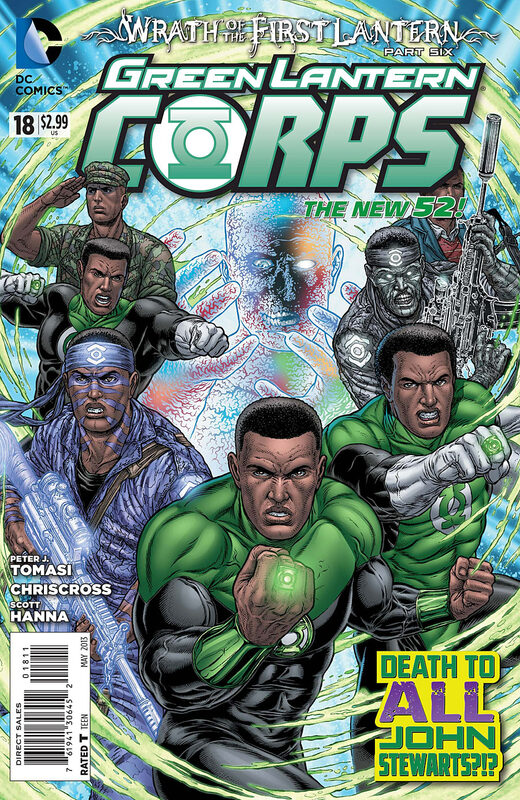 Cover-Multiple versions or parts of John Stewart’s psyche all standing behind the current rendition of John Stewart. My favorite of course is John as a purple lantern, that looks so badass! New Layers- This is the first time I’ve heard anything of John’s mother and her death. Black Heroes– John Stewart the most popular Green Lantern and Fatality. Lost relevance- Ever since the last crossover of the Green Lantern line of books I’ve been struggling to stay interested. The art has also taken a dive. Even with the recent announcement that John Stewart should have been killed I still find my interest in Green Lantern Corps and its seemingly endless crossover pattern dis-interesting and boring. Kill Him- So DC Comics originally planned to off dear old John Stewart which caused the writer to quit and the internet briefly imploded. I’m waiting for John Stewart to return to some relevance in the green lantern line so honestly…..maybe death would have done the character some good. Cover- The alternate cover which shows the standard in black and white falls very flat, the inks on this one are very subdued and dull, not good form at all! You are correct about the crossovers. I feel like I gotta buy 3 separate series just to follow the plot. The Rise of the Third Army was weak because I thought it would last longer and it quickly went right into the Wrath of the First Lantern. I have the Green Lantern series and the New Guardians series and quickly have realized if I dont go back and get the Corps series, I am probably missing out on a lot. Good post bro.